If you’ve picked up a newspaper or magazine in the past 10 years, you’ve read about vitamin D.
Maybe you’ve heard it called the “sunshine vitamin” or read that deficiency in vitamin D is linked to heart disease or cancer. You’ve probably also heard that “15 minutes of morning sun” is enough to meet your vitamin D needs or that “3 servings of dairy” will do the trick. Those statements are far from the truth (and kind of make me want to strangle magazine editors). I had the great fortune of studying vitamin D in a graduate-level Vitamin Metabolism class taught by, get this, a vitamin D researcher. She was, by far, the best professor I had and sparked my interest in this vitamin before my nutrition career even began. I remain fascinated (so much so that I’ve presented a crazily detailed lecture on the role of vitamin D in pregnancy at two gestational diabetes conferences). I share this so you can understand why I care so much about this vitamin! I’ve spent hundreds of hours pouring over the research and realized that it might be a good time to fill you in on the deets. After you read this article, you’ll probably see there are many things you didn’t know about vitamin D.
Why Should You Care About Vitamin D? Vitamin D plays a role in every system in the body, affecting your skin, brain health, bones, blood sugar, cholesterol, hormone balance, joint health, risk for cancer, and likelihood of developing autoimmune disease. And that’s just the short list. 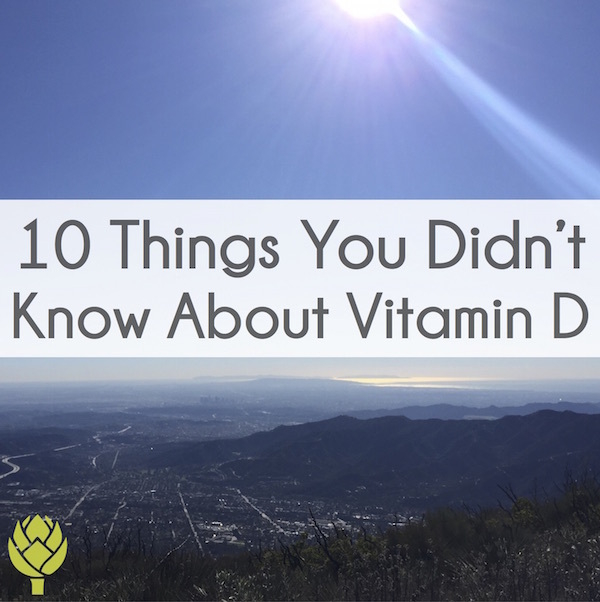 But this post is not going into the myriad of benefits of vitamin D. I will instead getting you up to speed on some little known facts about this vitamin (and correct some common myths), to ensure you don’t become (or stay) vitamin D deficient. How much vitamin D do you actually make from sun exposure? Does where you live affect your ability to produce vitamin D? Vitamin D is unique in that it’s not used in the body like most vitamins. It’s actually better classified as a hormone. Its primary role in the body is to maintain normal blood levels of calcium and phosphorus, but it has far-reaching effects across body systems, from bones, cardiovascular, endocrine, neural function, immune health, and a whole lot more. Vitamin D is so crucial that it actually regulates the activity of over 200 genes, which is many fold more than any other vitamin. If I asked you to do a quick word association exercise with vitamin D, two words would probably pop into your head: 1) sunshine and 2) dairy. The second one is thanks to some very clever marketing tactics from the dairy industry. But dairy is not always a great source of vitamin D. That’s because animals, just like humans, make vitamin D from sunlight exposure. Most dairy cows in the US are not outside in pasture, grazing on grass, but raised indoors. Secondly, vitamin D is fat-soluble and most Americans (sadly) opt for fat-free or low-fat dairy products. That means most of the naturally-occurring vitamin D is gone. Although most milk is fortified with vitamin D, that’s less common in other dairy products, like yogurt and cheese. Whatever vitamin D is added to that non-fat or low-fat dairy probably won’t be absorbed very well (it’s called a fat-soluble vitamin for a reason). So, if you’re expecting to get much vitamin D from dairy, opt for products made with milk from grass-fed, pastured-raised animals and always buy full-fat. That means, if you’re not in the sun much (and believe me, that’s most people as I’ll explain below), you’ll need a supplement to meet your needs. And the measly amount in in your multivitamin probably isn’t enough (I’ll get into that later, too). One of the coolest things about vitamin D is how it’s made. I’m kind of obsessed with this whole process because there are so many factors that can mess it up. But, let’s talk about it first as if it’s a well-oiled machine. Vitamin D is made in your skin when you are exposed to UVB light at a very specific wavelength. The UVB rays interact with a precursor in your skin, 7-dehydrocholesterol, turning it into vitamin D3. From there, vitamin D3 is transported to different places in the body where it gets “activated,” meaning it’s ready for use by the body. Now that you know the basics, let me explain more cool (or not-so-cool) things about this process. 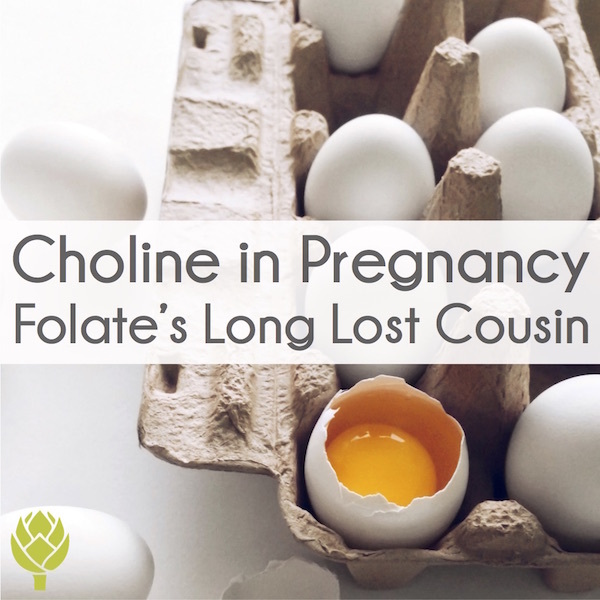 This brings me to the next commonly overlooked challenge with this nutrient. Remember the sun rays that give us vitamin D? Well, they are shining year-round if you live in the tropics, but the further you get from the equator, the less of those rays you get. And because the Earth rotates on a tilted axis, those rays are virtually non-existent in winter months at far northern or southern latitudes. This explains why native populations that live in far northern latitudes traditionally ate so much marine animal fat, which is rich in vitamin D (such as seal, whale, and organ meats, like cod liver). Obviously, sunburns are harmful, so if you have pale skin or burn easily, it’s ideal to get a little sun exposure on bare skin and then lather or cover up for the remainder of your time outside (or simply avoid long periods of time in the sun). You might have heard that you should avoid mid-day sun exposure, since that’s when the sun emits more damaging rays. However, those “damaging” rays are the ones that your skin uses to make vitamin D. UVB rays are at their peak between roughly 10am to 2pm, so if you’ve been taking an early morning walk to get your vitamin D, you might want to rethink it (or spend some additional time outdoors mid-day). Deficiency is widespread and more prevalent at northern latitudes. Your best bet is to get your vitamin D levels checked by your doctor via a test called “25-hydroxy vitamin D.” Typical labs suggest vitamin D levels around 30 ng/ml, but many researchers suggest optimal vitamin D levels are above 50 ng/ml. If you are deficient, it may take a few months of supplementation to normalize your levels. And since vitamin D levels tend to vary with the seasons, it’s wise to get your vitamin D levels checked periodically and possibly supplement more in the winter if your levels dip. Pregnant women are especially at risk for vitamin D deficiency. One study in South Carolina (latitude 32 degrees) found high rates of deficiency, especially in women of color, despite living in a latitude where year-round vitamin D production from the sun is possible. In that study, vitamin D deficiency was seen in 67% of Caucasian women, 81% of Hispanic women, and 98% of African American women. 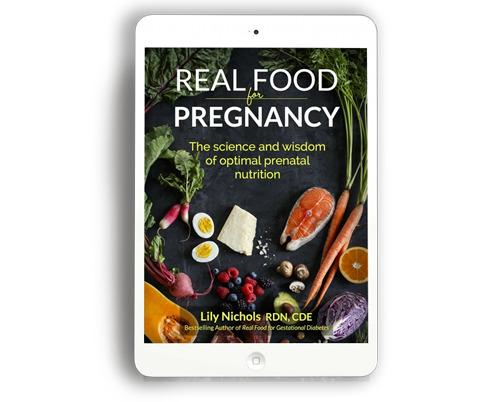 I talked about the crucial role of vitamin D in pregnancy (and more) in this prenatal nutrition interview and extensively in Chapter 6 of my book, Real Food for Gestational Diabetes. In fact, a recent review of the standard vitamin D recommendations found that the Institute of Medicine (IOM) underestimated vitamin D requirements by a factor of ten. Not a typo. A FACTOR OF 10! So if you’re relying on a multivitamin that gives you “100% of the daily value of vitamin D,” there’s a pretty good chance you’re not getting enough. The current recommended intake is set at a paltry 600 IU for adults, yet Robert Heaney, a well-known vitamin D researcher and medical doctor is speaking out. Odds are you’re deficient in vitamin D, just like the rest of us. I highly recommend monitoring your vitamin D levels to see if that’s really the case. If you are, in fact, deficient, always opt for vitamin D3 when choosing a supplement, which is more effective at maintaining blood levels of the vitamin than vitamin D2. Unfortunately, many prescription vitamin D preparations use D2 instead of D3 (mind boggling), so read your labels carefully. Vitamin D3 is both inexpensive and easy to find over the counter (and it’s identical to the form of vitamin D you make from the sun). I like this one. Vitamin D supplements should be taken with a meal that contains fat to be absorbed properly (remember, it’s fat-soluble!). There are a variety of nutrients that work synergistically with vitamin D, including vitamin A, vitamin K2 (both of which are found in animal fats, like the fat from grass-fed beef), magnesium, iron, calcium, zinc and boron. So, don’t expect vitamin D supplements to be a cure-all. A well-rounded real food diet that’s rich in micronutrients is essential. Are you sick of science yet? I know I could use a break! But before you go, I’d love to hear from you. Did you learn something new about vitamin D today? Which of the 10 benefits listed above did you find most interesting? 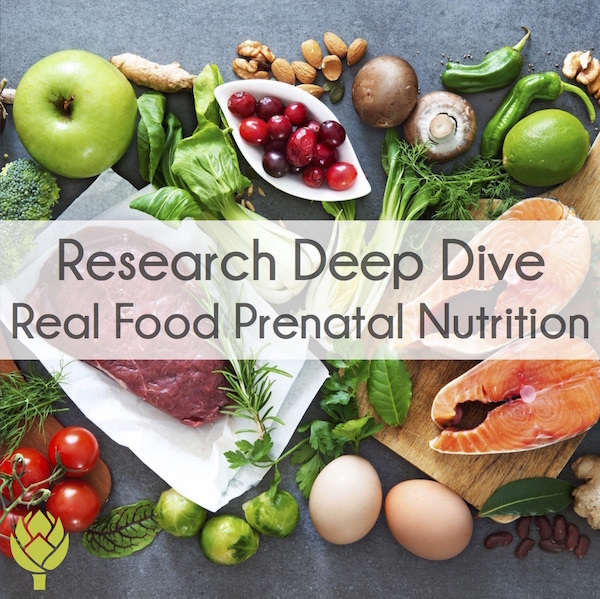 PS – If you’re a healthcare professional that works with pregnant mamas or you’re currently pregnant and love nerding out about research, listen up. 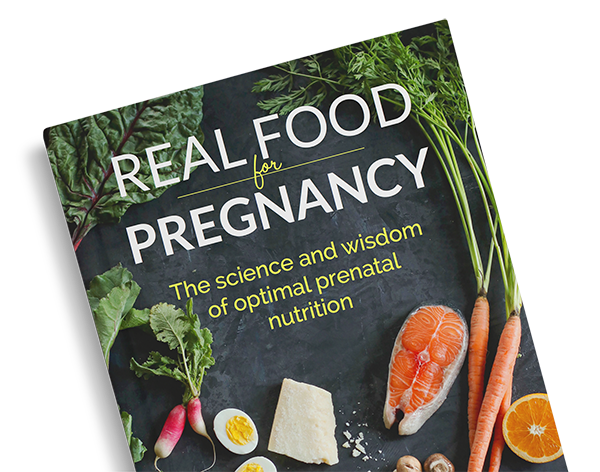 I’m teaching a super detailed webinar covering “Everything you need to know about vitamin D & Pregnancy” on July 12th at 10am PST/1pm EST. Current guidelines on vitamin D screening & supplementation mean that many women are deficient throughout their pregnancies. This desperately needs to change and I want to give practitioners all the information to make a dent in this epidemic. Get the details and sign up here. Loved this article. Fascinating information. You always make it interesting and I know its been well researched! Thanks so much for the information did not realize just how important vitamin D3 is. No one to date has said though (not even Dr Gundry) that every vitamin D (& most others I found ) & the 5k units I took 4 five yrs. was loaded wi SOY! Found no soy 2000 units Whole Food Based at CVS Online. Carlson brand is in a base of coconut oil, not soy oil. I have had Crohn’s Disease for 43 years . Along the way there was never a Dr. That prescribed Vitamin D for me or told me I was deficient. In 2012 I became really sick again and I started to do more research on my own. This is how I found out I was probably deficient. I started taking it along with zinc and mentioned it to my Dr. Later and now they recommend it also. I also take probiotics and B-12 shots once a month. Thank you for bringing this to our attention. The more individuals as yourself working for the better health of all the more we will hopefully pay more attention. My youngest son goes to Ball State. He is working on his master’s degree currently. RDN. His desire is to help also in many areas of health and autoimmune. Thank you again. What you do I greatly appreciate. Didn’t realize there are different types of vitamin D. Will definitely need to look for D3 the next time I’m checking labels. Luckily most of the over the counter options are vitamin D3 (also called cholecalciferol) these days, but you always want to double check! Thank you for the great info. My doctor recently shared that my vit. D level = 8 so she prescribed D2 supplement 50K units one tablet per week. Is it better to take lower dosages more frequently during the week or is once a week tablet fine? Should vit d be taken with food or on an empty stomach? With juice or water? Which is best for optimal absorption? Wow, what a comprehensive post Lily! I knew some of the facts, which is why I make sure to walk outside with no sunscreen on for at least 20 minutes a day, but I had no idea D2 versus D3 as supplement. Thanks again for bringing old-school wisdom and leading-edge science together into something that is so informative and useful! You bet, Lana! Glad you learned a few new pearls. These facts are so interesting! Thanks Cassie. I certainly think so, too! Lay in the sun for how long? Jake, The study did not specify beyond this. As I explain in this post, skin tone, latitude, time of day, & season all impact this. That’s the challenge in quantifying vitamin D production from the sun. It’s different for everyone. You can read the research for the full explanation: Holick, Michael F. “Vitamin D: a d-lightful solution for health.” Journal of investigative medicine: the official publication of the American Federation for Clinical Research 59.6 (2011): 872. Regarding sun exposure, does the time of exposure need to be continual? I.e. 20 minutes straight, or is it just as effective 10 minutes/2x during the peak hours for a total of 20 minutes? No it does not need to be continual, but there’s some research suggesting the warmth of the skin (from sun exposure) enhances vitamin D3 production. It likely depends on your natural skin tone (melanin content). Great article! I’m wondering about vitamin D stores in the body. I know it probably depends on several factors, but is there any research on how fast vitamin D level stores can be depleted in the body? Thanks! We can store vitamin D for weeks, if not months. Vitamin D obtained through sun exposure maintains vitamin D levels better than supplements, according to Holick. This was so helpful thank you! I am on a vitamin D kick. This just nailed the coffin for me. But have you heard of recent studies where VD deficiency is linked to depression? Yes, vitamin D deficiency is linked to depression. most people I know including myself are vitamin D deficient. A few weeks ago this doctor on cbs morning show said do not take vitamin D , that it is bad for our health and causes underlying problems. He got my attention as this is against recommendations of health establishment. I wish I could the problems he discussed, the doc is a regular and always wears a black seater! This is the most comprehensive article on Vitamin D I have read! The data on Vitamin D production in the winter and when wearing sunscreen is so compelling… we need to supplement! Oh good, Liane! I could have listed another 10 things since this “vitamin” is so fascinating, but had to stop somewhere, haha. And yes, the majority of people will need a supplement. I took Vitamin D for a while, but after some blood work I was told my levels were too high. I am now really confused. I try really hard to take care of my body and would like to know what your thoughts are on my situation. You’ll need to consult your physician and have your vitamin D levels monitored to guide how much to supplement. There can be “too much of a good thing.” Check out the Vitamin D Council for more info. How much magnesium do need to take with D3? vitamin d sits in the oils of our skin and after exposure it is important to not soap up your arms and legs to optimize uptake. How does 50 ng/ml translate into IU’s ? Thank you. It doesn’t because they are two different things. ng/ml refers to the units used to measure blood levels of 25-hydroxy vitamin D (they are also measured in nmol/L). 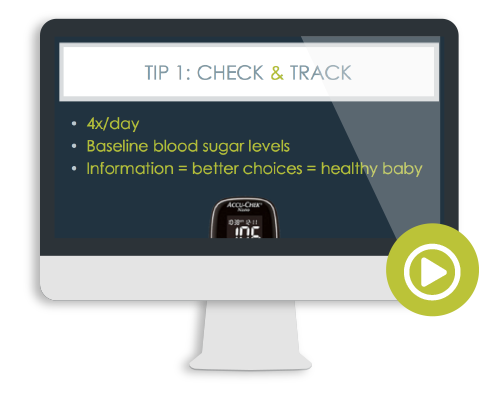 IUs are the units that measure vitamin D from supplements. The IUs of supplemental vitamin D needed to raise blood levels differs person to person, which is why you should get your blood levels checked periodically. Are we to take Vitamin D with calcium supplements for better absorbtion? And take them separate from other vitamins so the don’t compete with absorbtion? Very informative article. I had my blood work done in Nov and was just going over it again checking on something else when I noticed how low my D is. Cannot believe my dr did not catch that and prescribe a supplement. She is generally very thorough. And she knows how badly I have been feeling for a long time. Anyway, I was wondering if you could repost the brand that you prefer. I tried several times to pull up the link and it does not appear. I was wondering if you have an opinion on Nordic Naturals or supplements from Douglas Labs? Thank you so much. I’m not partial to brands. As long as it’s D3 and not full of a bunch of harmful excipients or fillers, it’ll work. I like Carlson’s because it’s in a base of coconut oil and you can easily increase or decrease your dose (without having to take a pill). I like the facts on what vitamins are compatible with each other. Thanks for all this great information. I just shared on FB! Wow, had no idea about some (most) of this! Thanks for the great info! 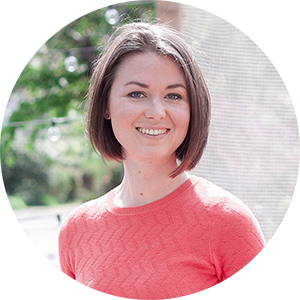 Lily, this is the best article that I have read to date on Vitamin D. It is a really misunderstood (and misrepresented) nutrient, so thank you for clarifying! Really helpful. I heard that redheads do not metabolize vitamin D very well so they should spend more time in the sun. This redhead gets horrible sunburns in about 10 minutes of mid-day summer exposure. What are your thoughts? Very informative. Too bad isn’t one standardization for guidelines. It’s so confusing when there is conflicting information. Wow, great post about Vit D, Lily. I haven’t been using as much sunscreen since I got pregnant (I haven’t found a natural one that I like, yet), but I was thinking to myself, ‘Hey, I’m getting my vitamin D!’ – and it’s interesting to know that I’m not getting as much Vit D as I thought, because I am tan, tan, tan. Island girl. And it totally makes sense that I have built in sun protection already – I kind of already knew that, but I never thought about how it would affect my Vit D intake. Great info about dairy, too! Great article. What would you suggest for breastfed babies, sunlight or supplement? Thank you. 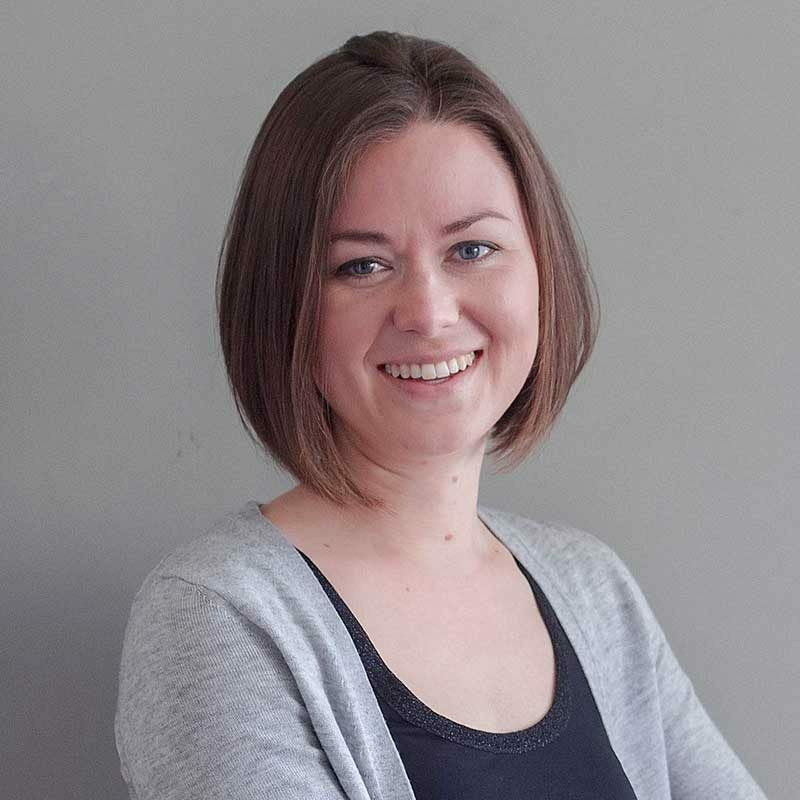 Hi Kylee, If a mom has normal vitamin D status, her breastmilk will be a good source of vitamin D. Unfortunately, that’s pretty rare (a 2012 review of 7 studies found the average vitamin D content of breastmilk to be only 10-80 IU per LITER. Although I’m an advocate of breastfeeding, formula is standardized to 400 IU/liter.). This is why the AAP suggests a daily 400 IU vitamin D supplement for breastfed babies. Hollis BW1, Wagner CL. Vitamin D requirements during lactation: high-dose maternal supplementation as therapy to prevent hypovitaminosis D for both the mother and the nursing infant. Am J Clin Nutr. 2004 Dec;80(6 Suppl):1752S-8S. Super article, Lily! I’ve been researching ideal Vitamin D levels for cancer patients for a while but it’s a pretty confusing area. It seems that levels that are too low are detrimental but also if they’re too high! Have you come across any reliable research on this? I think it also depends on type of cancer- it’s complicated! Yes it is, Patricia! There seems to be a J-shaped curve with vitamin D levels, meaning really low levels AND really high levels are linked to higher rates of disease. You may be interested in this study, which looked at vitamin D levels in free living nomadic tribes in Africa. This gives us an idea about truly normal vitamin D status, not just the average of what clothed, stay-out-of-the-sun folks have (which is what most of the reference ranges are based on). Their mean vitamin D levels were about 50 ng/ml. Fab Lily, will definitely look into this study, thanks! Question regarding: “Opt for mineral-based sunscreens as the chemical ones are highly toxic.” What is an example of a mineral based sunscreen? How can I find one? I have that very fair (almost glow in the dark pale) skin. I do take 15 minutes of sunshine at a time and after 2 times usually around 10am and again around 1pm, I am fully pink. I know there is a need to balance my intake of vitamin / hormone D and protection against skin cancer, but I didn’t find how to tell when we have the balance correct; so I hope you continue to write on this topic. I know getting more vitamin D helps me handle depression much better, even if — at the moment — I cannot avoid it altogether. For a person prone to depression how much vitamin D do you recommend daily? Lastly, I have asked my physician for vitamin D testing and he said it is unnecessary. Why would he think that? Is it expensive? Hi Susan, Mineral-based sunscreens use zinc oxide and/or titanium dioxide to physically block UV rays, instead of chemical agents that absorb and filter UV. Check your local health food store. The only way to know if you have adequate vitamin D is to get tested. It’s a simple, inexpensive blood test. That will tell you if you need to supplement. I just ran across this awesome article (thank you) while researching high levels of vitamin D. My blood test results show 95 ng/ml, which seems high compared to all the articles I’ve read. I do not take a supplement, so other than staying out of the sun for a while, I have no idea how to bring my level down! I happen to live in Minnesota, so how in the world did I test high? My vitamine D level came back at 19nmol/L. I am having awful back ache, muscle tightness, muscle burning, and muscle aches. Feeling tired. no energy. My doctor have me one dose (orally) of 150’000UI and that’s it. Do you only start feeling better once the levels of vitamine D have come back up to at least 75nmol/L ? how long does it take ? my symptoms are still here 2 weeks after the dose of vitamin D. I am getting quite depressed as I am very active person and have been off sport for 3 months now and just unable to socialise or anything…. I’ve heard of this, but never seen any peer-reviewed data on it. If anyone is aware of such a study, please post! Great article! Very informative. Could you please link some of the articles ? Or the name of the vitamin D researcher-Professor that you mentioned ? I would love to learn more about this issue. I am completing my bachelor’s in nutrition in sunny Mexico City and I recently found out I am vitamin D deficient (20 ng/ml) along with being osteopenic at 23. Could this be only because vitamin D deficiency ? Or may it be because of something else? I am currently taking a supplement of 1,000 IU of D3. Thanks for the interesting reading! Your articles are my favorite Lily! Thank you for sharing your knowledge! 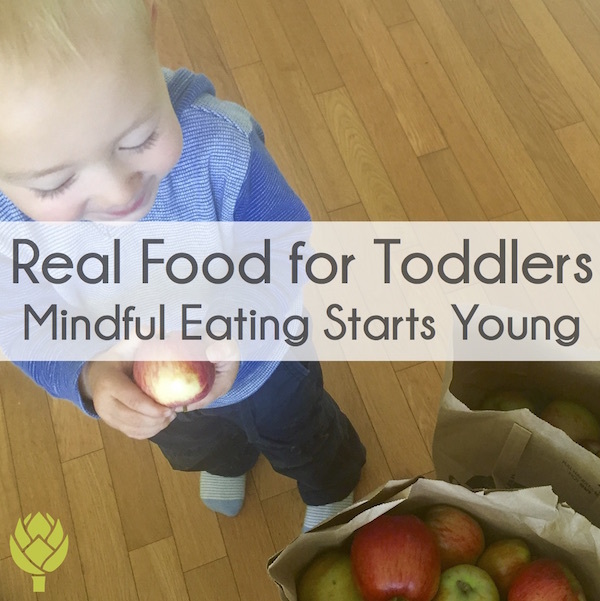 What do you recommend for toddlers no longer breastfeeding? The Vitamin D Council suggests dosing by weight: 35 IU per pound of body weight. A 30 pound toddler would need approximately 1,000 IU per day. Im a redhead and I heard the red heads produce their own vitamin D so they dont need as much sun exposure as a lot of tabber people. But I ended up getting a vitamin D deffiancy. Im wondering how that happened so easily? Vitamin D is only made in the human body in response to UV light exposure. Red heads are no different, but because your skin doesn’t have much melanin, you can make adequate vitamin D with *less* sun exposure than someone with naturally darker skin. My vit D Was soo much law it was just 12 and taking the injections an supplements of vit D3 from last 2 mnths but the level is still law..and having trouble in doing all works of my children and my house..still have upper back pain that i cant lay down more than 2 or 3 hours..paun and pain..tell me something that can help me..im from pakistan..i shall b very grateful..thanks. Awesome information. Thanks a ton. Could you Pls email how often, morning/night, for how many months to take the vitamin d3 supplement? BE CAREFUL WITH HIGH DOSE SUPPLEMENTATION OF D3!!! Supplementing without the appropriate dose of COFACTORS will make any high dose regimen of D3; TOXIC. For every 10, 000 i.u. of D3 you should be taking 1,000 mcg (micrograms) of vitamin K2. Vitamin A. at about 5,000 units daily as well as the recommended dose of Omega 3 fatty acids and increased amounts of Zinc and Magnesium are also necessary as they are used up in the process of D3 metabolism. Failure to observe this will result in the D3 being deposited into soft tissues (i.e. Arterial calcification!!) . In other words; your supplementation will effectively be as harmful as it is useless. An excellent site that reveals this and other useful D3 information is at takeD3.com. Look for the Author; Vitamin D researcher; JEFF T. BOWLES. Just found out my Vit D levels are below normal. I have started to take 50mcg of pure D3 drops daily. Is that enough? My blood calcium is normal so I am afraid to take a supplement containing calcium for fear of getting kidney stones. Any comment welcome. Yes I learned new things about vitamin D. Just want to know how can fish cod liver oil help in increasing Vit D. Along with cod oil sun exposure is necessary? This article was very useful and helpful, especially regarding the best time to walk in the sun and the fact that people that tan quickly do not absorb as much vital D as light skin people. Never new this. Thank you! Hi! Does it help if the vitamin D supplement is within an oil-based capsule? Do we still need to take it with a fat-containing meal? It helps, yes. You still absorb it better if you consume alongside a meal/snack with fat. Even a few nuts or some cheese would help. Thanks for this article!? What about vitamin D for toddlers? Thank you! Is there any evidence of elevated D3 being feto-toxic? My Dr. mentioned this at last OB appt when I asked for Vitamin D screening. 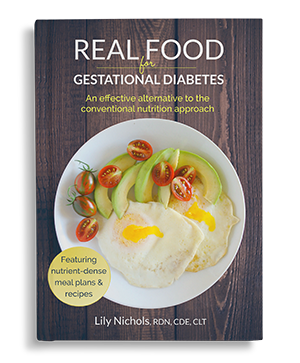 PS: I’m reading real food for GDM now and it’s such a great resource! I’m not aware of that. Perhaps they are confusing vitamin D with vitamin A? As I state in the article, I suggest having vitamin D levels monitored, so you can fine tune your supplement dosage. I am 55 and recently had breast cancer, surgery & radiation, including removing my ovaries. I have terrible hot flashes. I read if you take 1000mg of vitamin C & 800 mg of Vit D, that it helps. I have been taking that and it definitely helps, but I wanted to know if you know of a natural way to help with hot flashes? certain foods or vitamins without taking medication. I am a midwife encouraging all pregnant women to get vkt-D tested. Drs don’t give it any importance. Also, researching, I came across studies and medicine blogs that say we need to be less enthusiastic abou t vit-D, that 4000 IU a day is toxic and that population should not be screened….have you come across that as well? I think more info on vitD and pregnancy impact would be great for this post. 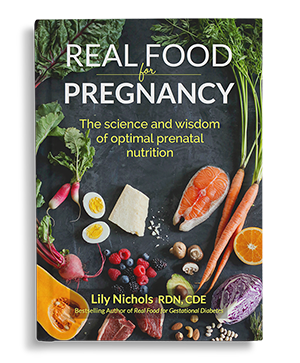 I do have both of your books, but would love to know more about how it actually improves pregnancy outcomes. Great post!! 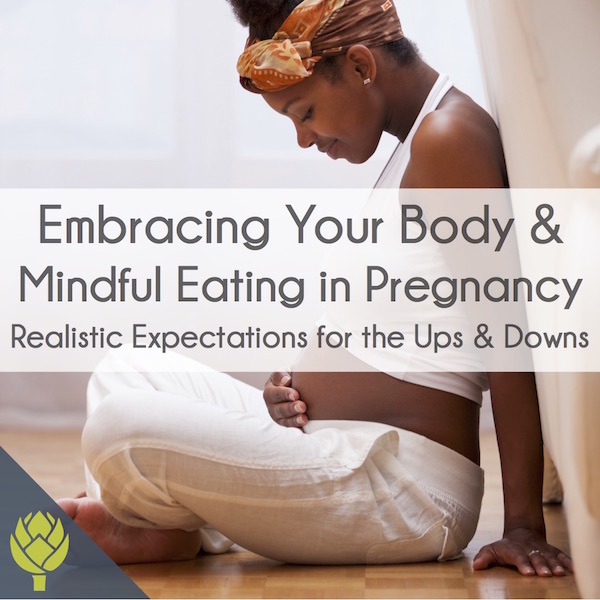 I address all of this in my practitioner webinar on vitamin D & pregnancy. Does this vitamin will darker my skin even more?